We've come a long way, babies. So it's been one year since I fainted at church while songleading, passing out in front of the whole congregation and taking the podium with me. One year since I was rushed to the hospital where it was revealed to us that for some unknown reason, God had decided to send twins our way. A lot has happened in a year, not the least of which is: - Sophie's eye operation - being pregnant with twins while running after a 1 year old - painting a new Christmas card and selling my cards for the first time - going into labor 10 weeks early - major surgery and a wound that wouldn't heal - new babies that needed constant attention, medication, and monitoring - constant shuttling back and forth between home and the NICU for 72 straight days - lugging around 5lb monitors and wires with each baby - depression, pretty much since this time last year and - babies that now weigh over 16lbs (more than quadrupling their birth weights) - therapists' visits put their (adjusted) development right where it should be... phew! - an 18 month old that has the vocabulary of a 3 year old and astounds me every day - a triple stroller that makes passerby smile and point as we go by - finally getting to wear my own fall and winter clothes again and putting those maternity clothes in storage - fitting into my pre-Sophie jeans and getting back to my normal shape - getting over myself and accepting help with meals and babysitting - exercising again - eating healthy and marathon Sunday-afternoon baking sessions - possibly (gasp!) going on a DATE outside of my house with my husband - the Big 33 List I'm looking forward to maybe having a calmer year this year, one involving much less trips to the hospital. 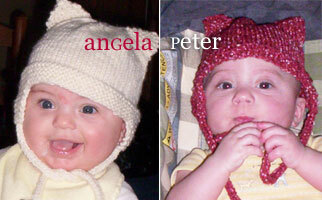 ps ~ So here are the muffins at almost 7 months old, wearing their newly-knitted kitty cat hats. Sophie's is almost done too.